Holy Cow...That was a big win!!! 9 yards of fabric and a gift certificate...worth the trouble to enter...Congratulations!!!! You soooo deserve to win! Extremely well deserved dear. Your designs and style are elegant and comfortable. Blessings and Congratulations! Congratulations Celeste! What a wonderful prize. Your sewing room looks amazing. I guess I missed your last post so didn't have a chance to vote for you. I've been pretty sporadic about blogging lately. Congrats on the win!! Your sewing room is so pretty. Have fun playing with all that fabric. Congrets; well deserved and one never knows what a few votes could generate. Congratulations. I can only imagine what you will do with all that fabric. Oh I am so happy that you won - congratulations!!!! Now you can sew up a storm with your new material. that's what i call a big win! what are you going to do with all that material? enjoy it all! Congratulations!!! Happy that you won and that is a great prize! Your sewing room is awesome and worthy of a prize! Congrats again!! Congratulations, Celeste! What a great prize. Congratulations Celeste! Hard work pays off...wonderful prize! I`m so glad I voted for you, and was a tiny little part of the ones making you win dear Celestina Marie. Congratulations dear... it is so well deserved , with your most wonderful sewing room. I wish you a lovely weekend, dear friend. Huge congratulations, dear friend and I am so happy for you. Your sewing room looks so inviting and cozy, so a very well deserved win. How much fun you will have with all the fabric and the gift cards, enjoy. Thanks so much for coming to visit me and sorry I have taken so long to come and visit you. Congrats on your win, you are a deserving participant. Hello Friend! Wonderful! Congratulations and good luck! Hugs! Rosemary! Congrats Celestina...what a wonderful win! I can only imagine the goodies you'll come up with! 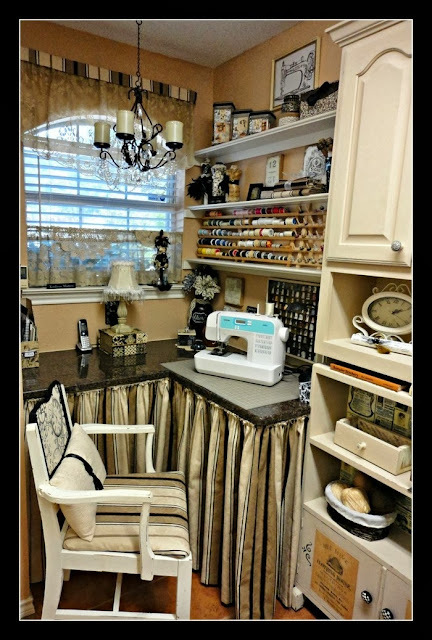 Your sewing room is inspirational and so beautiful, hopefully someday for me! Congratulation. I`m so glad you won. Congratulations on your win. Such a wonderful prize! Lots more fabric to keep you busy. Enjoy those cooler days! Congrats. How wonderful...you deserve it! Congratulations Celeste. I am not surprised that you won, your style and work is so wonderful. I so admire your style and your ability to change the look of a room with fabric.